“Take your socks off... they're too thick.” she suggests. Peter removes his sock and squeezes his foot inside. “Better?” his sister asks. “Kind of... but won't they rub without socks.” he replies as his bare skin rubs against the leather. Peter pulls the thin pop socks on before effortlessly sliding his feet inside the tap shoes. He fastens the buckles and stands up... and slowly goes through the basic steps his sister has taught him. A broad grin crosses his face as his feet finally produce the same tap tap tap sound as his sister's, and they spend the next hour or so dancing on the patio. “I've been teaching him some steps and he's really good!” Sally proudly states, before telling Peter to demonstrate what he's learnt so far. “That is good Peter.” his mother replies, "Are those Sally's shoes?" she asks, looking at his feet. "Yes." Peter replied. "My own shoes just went thump thump thump!" he explained, looking down at his feet. "These are much better." he adds, tapping them rhythmically on the decking. Their mother tells them that supper would be ready soon, so they have a last practice before going indoors. They have supper and Mother says it's nice to see them doing something together for a change. As usual, Peter and Sally wash, dry and put away the dishes before wiping the dining table and kitchen worktops. Later, Peter joins his mother and sister in the sitting room where they watch TV, and sits himself in his usual chair. "You've still got Sally's tap shoes on I see." his mother says, looking at his feet. "Oh er... yeah." Peter replied. "I forgot." "That's quite a high heel, are they comfortable?" Peter put his foot on his knee and pays closer attention to the heel. "It's not high." he replied, looking at his mothers feet. "Yours are loads higher." "I meant high for a boy." his mother replied, "You can dance in them so... they mustn't be too high for you." Peter looked at his foot, clad in his sister's feminine tap shoe and thin white pop sock. He hadn't really given the style a second thought... but now, maybe they are a bit girlie. "Hey peter... you should come to dance class with me this Saturday!" Sally interjects. “Well yes.... but boys can go too.” Sally replies. "Just because it's all girls doesn't mean it's only girls." she adds. “Can he mum? Can he?” she asks. “It's up to you Peter.” their mother says. “If you want to go then you can.” She glances at his feet once more. "You certainly seem to have a talent for it." Over the next few days, Peter dons his pop socks and tap shoes and practises with his sister in the garden. Mother is happy that they finally have something in common, but isn't too sure about the Mary Jane style tap shoes and white pop socks he seems happy enough to wear. The following week, Sally takes her brother to her tap dancing class and introduces him to Miss Baxter, the dance teacher. “Welcome Peter. You want to learn to tap dance?” she smiles, he nods nervously. “It'll be nice having a boy here for once.” she says, before asking him if he's had any classes before. “Sally's been teaching me some steps.” Peter replies as he nervously glances around the room, feeling a little out of place. “Do you have any tap shoes?” the teacher asks. “OK.” Peter replies honestly. "They're not high." Clutching his shoes, Peter walks across the floor towards the changing room as all the girls eye him with suspicion. The changing room is empty so Peter gets himself ready for his first formal tap dancing class. He knows he's in female territory and as such, is clearly self conscious as he steps out into the studio. A gabble of sniggers echoed around the studio as he noisily walks in his tap shoes to his sister, who's grinning face is as welcoming as ever. “You look great Peter.” she says, looking him up and down before glancing around the class nervously. Peter blushes and looks down at himself, clad in the same black leotard and short skirt that Sally and all the other girls wear. He nervously looks around the studio as he feels the eyes of each and every one of them focus on him. Some giggle and point, some glance and whisper whilst others just stand and stare. He knows he's out of place, and they know it too. He looks back at Sally who smiles reassuringly. “Now now girl's, we're here to dance and not snigger.” the teacher states loudly before getting them all in lines to do their warm up and stretching exercises. The sound of some 20-30 pairs of feet, all tapping away in near perfect rhythm fills his senses. He closed his eyes for a moment and just danced and listened to the sound. "This is awesome." he thought as he opened his eyes. He looked at the reflection of the entire class and for a brief moment he wondered which one's me? "...two, three, on-the. Beat, two three, four. Good, two, three..." the teacher continued as she paced up and down. The only thing that set him apart from all these girls was his pop socks (they all wore tights) and his hair. Their skirts flicked up way beyond the knicker line just as his did. If it wasn't for his leotard, he and all the other girls would be flashing their underwear at the end of every fourth bar! He knew he should feel more embarrassed than he does in his short bouncy skirt, but seeing as this is part and parcel of a tap dancing class, it's fine. "...two, three, on, the-Beat, two, three, good" the teacher claps as Peter tries to keep up. He looks at his feet and listens to the beat... making sure he taps in time. His short bouncy skirt sways this way and that and he wonders why boys don't wear shorts instead. He looked back to the mirror and took in the entire scene of dancing feet and bouncing skirts once more. He imagined he'd look out of place out if he was the only one not wearing a skirt. “On the beat Peter... good! Three, four” the dance teacher clapped, snapping him out of his thoughts. "...three, four. Use your arms Carol, four. its-Not river dance, four. Like, me, three, four. Good Peter..." she went on. Peter did feel very self conscious being the only boy in a room full of girls, but every time he glanced in the mirror he knew he didn't stand out too much. He was only one small part of a tap dancing troupe and was enjoying every minute of it. Once the class is over, a gabble of girls encircled Peter and tell him he was really good “for a boy” and other such misandrous compliments. The teacher claps her hands loudly and tells the girls to stop chatting and go and change. "I have another class after this one!" she states. The girls disperse and Miss Baxter asks Peter if he's enjoyed his first class. “Yes miss.” he replies, glancing at his sister. “Well I think you're not only very talented, but you're also a very brave boy... so I'm more than happy for you return next week.” she smiles. “Yes!” Sally exclaims as her brother says thank you and smiles appreciatively. “You don't mind fitting in with so many girls?” the teacher asked. “No miss.” he replied, looking down at his costume. “I mean, I felt a bit silly at first but after a while it was OK.” he explained. “Normally boys wear shorts or track pants.” Sally said. A full on blush crossed Peter’s face as he realises his error. Miss Baxter explains that she only expected him to change his shoes. "You didn't have to change your clothes too." “Oh there's no need to apologise Peter... you've done nothing wrong.” the teacher reassures. Their attention is drawn by a group of girls leaving and waving bye-bye specifically to Peter. He blushes, not knowing what to make of it; teasing or friendly... who can tell? Peter looks at his sister, then his reflection. "I'm such an idiot." he moans. "Bye Peter!" echoes across the studio once more. Peter looks for the source of the sound and waves shyly in the general direction of the door. He looks back at himself in the mirror, then to his sister. "You could have said something." After a pause, she replies, "I said you looked nice." "But you could have said..." Peter began. "Hey Sally?" A voice called from across the room. "Is your brother coming next week?" "Think so." Sally replies, before turning back to her brother. "I'm sorry Peter... I figured it was best to pretend it was normal... otherwise I'd have embarrassed you." “I think your sister did the right thing Peter..." Miss Baxter says, "...drawing attention to your error would have made you feel ten times more self conscious than you looked." she explained. "But judging by the way the girls have acted towards you, being a boy..." she says, knowing how mean they can be. "...I think they're quite impressed,"
"Well, on the rare occasion a boy joins... they tend to act cocky and show off... as if they're somehow better than the girls... you know what boys are like." Peter listens and agrees... so far. "Thing is most girls don't stand for that and soon bring them down to size... you know what girls are like." She steps around him and looks him up and down, from his low heeled black Mary Jane's and white knee high pop socks. His pale white legs and short black circle skirt. His short sleeved leotard and blond moppy hair. "I think by joining the class as you did and not being all 'boyish' is the best thing you could've done." Miss Baxter tells him. "Bye Pete!" another voice calls. "See what I mean?" Miss Baxter smiles. "Although I'm sure you'd rather wear shorts next week, it might be a good idea to come as you are.” she smiles as she places her hands on his shoulders, hoping to reassure him. "I think you should wear that again too." Sally says. "You did say we all wear them and you don't look silly at all." “I don't know.” Peter sighed, looking down at himself again. "I figured that boys don't come because they'd have to wear a skirt. But when we were dancing it just seemed 'right' that we all wear one." he explained. "I though it was normal but I just feel like an idiot now." "Well it's an easy mistake to make Peter." Sally said, "...and Miss Baxter's right... I think the girls have warmed to you because... like..." she paused, "...because they see you as one of us. Not just another boy." "But it was a mistake." "But they don't now that." Sally replied. "Your sister's right Peter. As far as the others know, you decided to wear the same as them in order to fit in... and it seems to have worked." Miss Baxter explains. "Now I can't tell you what to wear..." she says, glancing down at his feminine attire once more. “If you want to bring some shorts next week that's fine... but I'll make sure your costume is waiting, then you can choose either way.” she smiles. "Now why don't you two run along? I'll see you both next week I hope." Peter returns to the changing room and leaves the skirt and leotard as he found them. It all seemed so innocent when he removed them from the hook an hour ago, just as the tap shoes he's been wearing seem innocent enough... to him at least. It doesn't matter as long as they're tap shoes, he thought as he carefully wound his pop socks around his outstretched fingers, and put them with the tap shoes in his bag. Back in his own clothes, he exits the changing room and joins his sister. They leave the studio and walk around the block to the car park where their mother should be waiting. Another couple of girls from the tap dancing class wave a greeting to Peter as they climb into their parent's car. Shyly he waves back and comments that they haven't changed out of their dance gear. "Lots of them don't." Sally replied. "I think the skirts are a bit short for street wear." she adds glancing around the car park. "No sign of mum." she observes, before suggesting they wait on the wall. After a brief silence, and sensing that her brother is still feeling a little embarrassed, she asks. "So, apart from the mix up... did you enjoy it?" "Yeah." he replied. "I enjoyed it right up until she said I didn't have to wear that leotard & skirt!" Sally grinned the broadest of grins. "So... you enjoyed it all the way from the beginning to the end. That's good." she said. "You could have said something at the beginning though." he replied. "I know... but I didn't know how to say it." Sally replied. "Nobody else said anything and you looked happy enough, so I though it best not to say anything." she explained. “I honestly thought that's what we wore.” Peter stated, trying to convince himself that it wasn't my fault! “Well I'm glad you did.” Sally replied. "I was a bit worried how they'd react with a new boy joining... but you got off scot free." "What are they normally like?" he asked. "Normally they're fine if it's just girls... but a few months ago a boy joined and nobody was nice to him. They'd stare and whisper and gossip about him... then push him over when Miss Baxter wasn't looking, and claim he slipped or fell... he stopped coming after a few weeks." Sally told him. "But he did seem to think he was better than us girls just because he was a boy.... 'til we put him in his place"
Peter gulped at 'we put him in his place' yet was thankful he'd not been treated that way, so far. “You think I should wear the same thing next week then?” he asked as the words 'they're fine if it's just girls' rattled around his skull. “Yes. I think you should... but it's up to you.” Sally replies. “Here's mum.” she said, jumping off the wall. “Did you enjoy that Peter?” his mother asked as he climbed onto the back seat. He told her he did and Sally told her how impressed Miss Baxter was with his dancing, and that he could come back next week. “Oh that's good.” his mother replied. “Although it'll be a while before I can afford to get you some tap shoes of your own... and some dance-wear.” she added. “That's OK.” Peter replied. “I've got Sally's shoes and...” he cut himself short, not sure if he should tell his mother about the mix-up with the costume. “You don't mind wearing girl's shoes for now?” his mother asked. “I mean I would buy you some of your own but if you're going to give up after a couple of months it'll be a waste.” she explained. "One I can't afford." “No they're fine I guess.” he replied. Sally looked back at her brother and cast him a broad grin. “I don't think he minds wearing girl's shoes. He accidentally wore a leotard and skirt too and you didn't mind that did you?” she giggled. “Not until I realised I wasn't supposed to wear it.” he blushed. "I just thought that's what we wore." “What's this?” their mother asked, wondering if she'd heard correctly. Between them, they explained the mistake and the fact that everybody was OK with it. Sally said none the girls teased him, and added that the teacher said he could wear it again next week if he doesn't want to wear shorts. His mother glanced at her daughter who sat next to her in the passenger seat. They shared a grin before she glanced at her son through the rear view mirror. "Well if it makes you feel more comfortable blending in with a group of girls?" 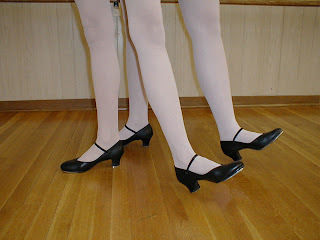 she says, visualising Peter and Sally tap dancing side by side in identical costumes. When they arrive home their mother makes them a sandwich each along with a glass of fizzy pop. It's a sunny day so they eat in the garden, and Sally suggests they should practice some more. “We could show mum what we learnt today.” she adds. "Seeing as mum pays for our classes." Their mother has been intrigued since they revealed that Peter had taken the entire class dressed just like all the other girls and, feeling like she's missed out, she says, "That's a very good idea." Ten minutes later, Sally and very sheepish Peter step out through the patio doors; Sally wears her black leotard with the Betty Baxter School of Dance logo on, with a voile wrap skirt. Whilst Peter wears a pale blue leotard and a matching skirt. "Well look at you." their mother smiles. Peter looks down at himself, gulps and smiles back. “If I'd known you looked that good in a skirt I'd have bought you one years ago.” his mother teases before they go through some of the basic routines they know. She watches for ten or fifteen minutes and is clearly impressed. “You are very good Peter, considering you've only had one lesson.” his mother says as they stop for a breather. “Well, Sally has given me lessons too.” he replies, much to his sister's delight. “Would you like more drinks? It looks like very thirsty work.” Mother asks as she goes to refill the pitcher. When she returns, they're sat at the patio table eagerly chattering. “It's hard to believe one of these gossiping girls is my son.” she grins as she refills their glasses. Peter blushes but doesn't seem offended. He looks down at himself and straightens his leg, pointing his toes. He's blatantly aware that he looks like a girl as he observes his short skirt, bare lags, socks and shoes. “Oh no!” he says in a sulky voice, lifting his knee and running his fingers down his shin. He quizzes his mother, who explains that pop socks are very delicate and don't last very long. “Fortunately they're cheap so I’ll get you some more before next week.” she smiles as she pushes her fingers through his hair. “You can borrow some tights if you want?” Sally offers. Peter looks at his sister's legs, clad in white tights which appear much thicker than his pop socks. “Aren't they warm?” he asks. “Not really.” Sally replies as she put her foot on the bench and runs her hand over her stockinged leg. “They're nicer than pop socks.” she adds. With a little prompt from their mother, Peter follows his sister to her room where she routes out a pair of tights for him. She lifts her skirt to show him they should go 'under' his leotard. Peter goes to his room and strips down to his underpants. He carefully pulls on the tights, followed by his leotard and skirt before he finally slides his stockinged feet into the tap shoes. His mother is the first to see him and she tells him he looks 'sweet'. His sister asks him how they feel. “Well... they are a bit strange... but quite nice I guess.” he replies, looking down at himself. Peter knows he's dressed as a girl and should feel a little embarrassed. But he did feel like he did fit in at his first tap class... and Sally was probably right; because he wasn't dressed as a boy. The following Saturday, Peter and his sister go to their tap class and Peter decides the best thing to do is wear the same as the girls again. The class is more or less the same; starting with a warm up and stretching, followed by a variety of basic routines. Miss Baxter claps the timing and shouts instruction, frequently reminding Peter to concentrate on keeping his head still. It's easier said than done when ones feet are tapping away, but he tries his best. After a short break, Miss Baxter drags a very large bag from the store room. "Right girls." she announces, pulling the bag open. "We'll do some pompom practice for the last half hour... so if you each grab a pair, we'll get started." "Pompoms?!" Peter quizzes as he and Sally approach what looks like a huge pile of tinsel. Back in line, Peter looks the reflection of the four rows of dancing girls, each holding a pair of big pompoms. "Now follow my lead girls!" Miss Baxter says, before pressing play in the cassette player. Peter soon realises that dancing with pompoms is harder than it looks. Miss Baxter walks over and gives him some one-to-one tuition, "Follow my lead Peter, and don't forget about your feet." she says. He tries to keep up but struggles to do one thing with his feet and another with his arms. "Concentrate on the steps but don't forget about your arms." she reminds him. "Head up Peter... and remember, the mirror is your friend." Peter knows he has a habit of looking down. He looks straight ahead at his own reflection; one of many girls in a bouncy skirt, waving his pompoms as best he can. He drops his head again to concentrate on his footwork, but Miss Baxter shouts "Head up Peter!" After the pompom practice, Peter confesses to Sally that that was hard. Once the class is over, Miss Baxter approaches Peter and says she's pleased he decided to return, and wanted to double check that he was happy dressing as a girl. “As long as you're happy, I'm happy... just don't get offended if I forget you're a boy and refer to the whole class as 'girls', which I tend to do.” she smiled. Peter felt himself blushing and said it was OK.
Miss Baxter then offered him some constructive criticism. "Whilst your foot work is excellent, you need to be more aware of your upper body. Your head and arms are all over the place, so you need to concentrate on being graceful as well as rhythmic." "I know... I can't help but look at my feet half the time." he replies. "Yes I noticed.. but remember you can see your feet perfectly well in the mirror." she advises. "along with the rest of your body. Grace is everything so if you're looking directly ahead, you're halfway to being graceful"
"I think part of the problem is that you're a little bit scared of your reflection." Miss Baxter suggests. "The best advice I can give you is, don't by shy when you look in the mirror and see a girl instead of a boy. Be proud of who you are and keep that head up." The sound of heels on parquet grabbed both Peter and miss Baxter's attention. “Hi Peter... how was class?” his mother asked. “Good.” he sheepishly replied. "I need to work on being more graceful." Miss Baxter and Peter's mother were already acquainted. They greeted each other before Peter's mother asked how he was getting on. “Very well.” Miss Baxter replied. “You have two very talented children.” she complimented. “Thank you.” his mother replied bashfully. She told Peter to find his sister and then get changed, before turning back to Miss Baxter. “I just wanted to check he was getting on OK and that you're happy to have a boy in amongst all these girls.” she said, glancing around and wondering which was her son, then spotting him chatting with a group girls. “He seems to be getting on fine... leaps and bounds as far as his dancing is concerned.” Miss Baxter replied. “And he seems to be fitting in perfectly with the girl's.” she said. “Yes I suppose.” his mother said. After a brief silence, Miss Baxter asked, “So, how do you feel about Peter attending?” she paused, "I mean, attending dressed as a girl?" “And you're happy for him to continue coming as one of the girls?” Miss Baxter asked. “Yes I think so...” his mother replied, trying to spot both her son and daughter amongst the various groups of girls. All of them are identical in their black tap shoes, white tights, black leotards and tiny flared skirts. "How does she tell them apart?" she thought before spotting Peter and Sally by the changing rooms, both looking just like the other girls; all legs and leotards. "He seems a little reluctant to work with the mirror." Miss Baxter adds. "I think seeing himself as a girl is a little off putting... he keeps dropping his head, then his arms go all akimbo." "Well I suppose it'll take a little getting used to... it's hard to think he's my son in his tights and leotard." his mother replies. "I've even started wondering what to do with his hair. He really needs a trim but I'm thinking I should tie it up in bunches instead.” she chuckled, not sure if she was joking or not. Enjoyed this story so far, I hope this is not the end of it and you will post more. Very nicely done.